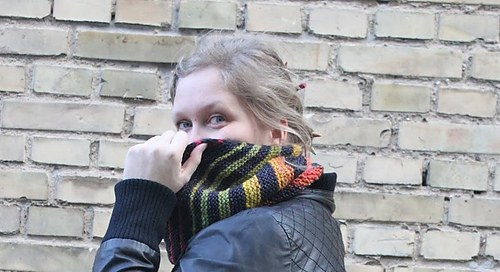 Only using about 1½ skein of DK weight yarn, this cowl is a great and quick accessory to make! 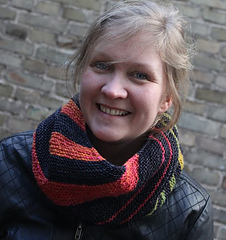 It looks good on both sides, the garter stitch and color changes giving a different effect for the “wrong” side. Use one solid and one color changing yarn, two semisolids, two color changing, or several different colors of yarn - it’s up to you. 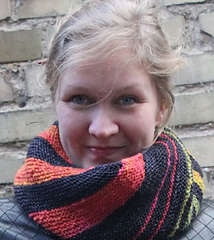 Biased stripes is a cowl in garter stitch with stripes and rounded i-cord edges. It is worked flat and on the bias, increasing and decreasing a stitch on every second row to create the slanting stripes. 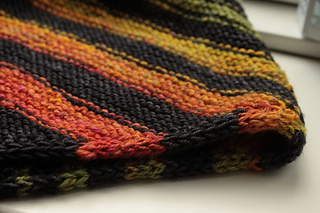 The two ends are then grafted together using kitchener stitch, so the cowl becomes a seamless looking piece. 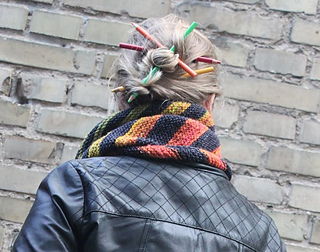 If you only use two different yarns, a minimum of weaving in of ends is required. The color yarn that is not active is brought up along the side at the work, cleverly hidden inside the i-cord edging. 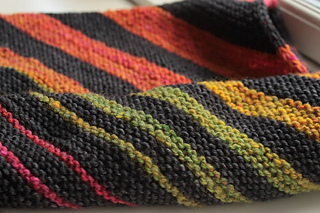 Illustrated directions are given for how to handle the color changes and managing the resting yarn while working a stripe.